These units are above-ground pumping and storage units for smaller developments or individual properties and comprise water storage and integral pump sets, all with pumps below the tank, thus minimising footprint sizes. Compact Miniboosters have twin pumps and are for the small to medium project and storage capacities, physical proportions and pump performances are designed in co-operation with our technical specialists to specifically suit site requirements. The Housebooster is for small projects and has a large storage capacity to compensate for a poor incoming mains flow rate. The Housebooster Compact has the same pump performance as the Housebooster but has smaller capacity storage and therefore requires a mains supply with a good flow rate. A particular benefit of the Housebooster Compact is the extremely small size - with optional kit it fits within a standard 600mm wide cabinet and below a kitchen worktop. 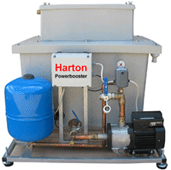 The Harton Powerbooster is for general commercial boosting purposes. Ideal for washdown bays, it has a break tank with type AB air gap, a high flow inlet valve and a fixed-speed pump with powerful performance to suit demand.